No one wakes up one day and realized that overnight they have grown apart from their partner; it happens slowly over time. It goes virtually unnoticed until the distance feels wide enough that you can’t help but notice how far apart you are now from one another. When did this all happen? How did this happen? It began the day you stopped being curious about each other? The day you thought you knew everything there was to know about the one you married. Occasionally I get the opportunity to work with husbands and when I do, one of the things we talk about is if they’re still curious about their wives…..
…curious about what she want to feel in their marriage (seen, understood, connected, intimate, safe…). We often don’t ask because we don’t want to know the answer. But those unanswered questions don’t get better with age. They fester…turning into disconnection and then resentment. It turns into a marriage in trouble and the explanation is, we have grown apart. 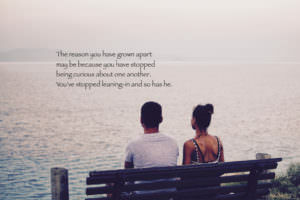 The reason you have grown apart may be because you have stopped being genuinely curious about one another. You’ve stopped leaning-in when he expresses excitement or interest about something because it’s not something you’re particularly interested in yourself. You’ve stopped really seeing each other. No one taught us this. No one taught us that we need to be engaged…. …we need to continue to get to know our spouses on a deeper and deeper level as the years go on in order to feel connected to one another. No one told us that if we don’t, we will slowly, but surely have grown apart. But now you know something you didn’t know before. And once you know something, you can’t un-know it. Lean-in when he’s sharing something with you that interests him. Become curious about yourself and be open and loving about what you discover.